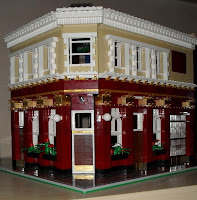 Brick Town Talk: WIP - The Queen Vic - LEGO Town, Architecture, Building Tips, Inspiration Ideas, and more! Spent the afternoon in the loft. I hope some people from the UK will recognise this famous building. If not I've added a clue. Great building to be inspired by... Love the colors. Those gold bricks and modified plates are painted? Did you thought about using 1x1 gold round plates instead of the plates with clip? The gold 2 x 2 bricks are real and the clips and jumper plates are freely available on Bricklink. I think they featured quite heavily in the first wave of Indiana Jones. The 2 x 2 gold bricks were in the Town Plan set as a statue/fountain. I used all my gold 1 x 1 round plates as milk bottle tops in another MOC - I should get some more. 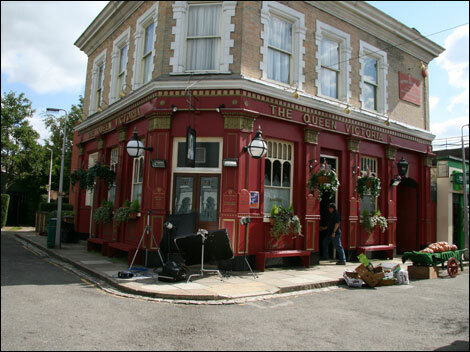 Awesome, gotta love Eastenders. The building looks so realistic too. Great work! Beautiful! Really great colour work and detailing. I do feel the ground floor is just a smidge too high.